History, AGNSW Permanent Collection Highlights. by an Australian artist, at the AGNSW. Among the best art museums in Australia, the Art Gallery of New South Wales (AGNSW), located in Sydney, is the fourth largest in the country. Founded in 1871, the AGNSW's permanent collection consists of more than 40,000 items, including many different types of art from around the world. In addition to its holdings of Aboriginal art and Torres Strait Islander art, it has an extensive collection of Australian art, as well as works from Europe, Oceania and Asia. Its collection of contemporary fine art photography is particularly strong. The Art Gallery of New South Wales receives 1.1 million visitors per year, and is the third most popular art museum in Australia (after the National Gallery of Victoria and the Queensland Art Gallery) and the 53rd most popular in the world. The AGNSW's club known as the "Art Gallery Society of NSW" has a total of more than 30,000 members, making it the largest arts base in the country. Other major Australian art museums include the National Gallery of Australia (Canberra), the Art Gallery of South Australia in Adelaide, and the Art Gallery of Western Australia (Perth). Meanwhile, other public art venues in Sydney include the Museum of Contemporary Art (MCA); the Nicholson Museum of antiquities, at the University of Sydney; the S.H. Ervin Gallery - the venue for the "Salon des Refuses", for works rejected by the AGNSW's Archibald Prize for portraiture and the Portia Geach Memorial Award for female artists - and the White Rabbit Gallery of contemporary Chinese Art, owned by Judith Neilson. 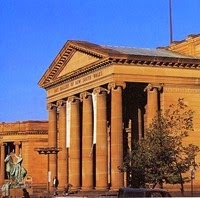 The AGNSW came into existence following the foundation of the city's Academy of Art in 1871, as a result of cultural idealism and intense inter-city rivalry with Melbourne, who already possessed the excellent National Gallery of Victoria (established 1861). The AGNSW's small inaugural collection occupied a succession of temporary sites until 1885, when it moved to the present building at The Domain, designed by Walter Liberty Vernon (18461914). The grand facade and old wing of the present building were constructed between 1896 and 1909, with new extensions added in the 1970s and 1980s. The permanent collection of the Art Gallery of New South Wales embraces works by Indigenous artists, as well as modern art and a wide variety of contemporary art from Australia and all parts of Asia. The art of photography is showcased using works by some of the greatest photographers in Australia as well as overseas. In addition AGNSW has a small but impressive collection of Old Masters - notably Dutch, French and Italian painters from the era of Mannerism onwards. In all, a total of over 40,000 items. This area of the permanent collection represents the visual art created by Indigenous artists from every corner of Australia. It includes desert paintings created by remote family groups, bark paintings made by the saltwater peoples living along the coastline, plus contemporary expressions of blak city culture by late 20th century/21st century artists. Types of media include painting, sculpture, photographs, installations, textiles and works on paper. This area dates from the early 1800s, and includes a large number of high profile works by 19th-century and 20th century Australian artists. Eras covered, include: Australian Colonial Painting (from 1800), Australian Impressionism (c.1886-1900) and Australian Modern Painting (c.1900-60). As a measure of the quality of AGNSW's Australian collection, 44 works of its works were listed in the book "100 Masterpieces of Australian Painting" (1973 edition). Aussie artists represented in the collection include: John Glover (1767-1849), Eugene von Guerard (1811-1901), John Russell (1858-1930), William Piguenit (1836-1914), E. Phillips Fox (18651915), Sydney Long (1871-1955) and George W. Lambert (1873-1930). The Heidelberg School of Impressionism is represented by artists like Fred McCubbin (1855-1917), Tom Roberts (1856-1931), David Davies (1864-1939), Arthur Streeton (1867-1943) and Charles Conder (1868-1909). Among the 20th-century Australian artists represented, are greats like William Dobell (1899-1970), Russell Drysdale (1912-81), Sidney Nolan (1917-92) and Ian Fairweather (1891-1974), as well as Arthur Boyd (1920-99), Rupert Bunny (1864-1947), Grace Cossington Smith (1892-1984), HH Calvert (1870-1923), James Gleeson (1915-2008), John Olsen (b.1928), Hugh Ramsay (1877-1906), Lloyd Rees (1895-1988), Imants Tillers (b.1950), JW Tristram (1870-1938), Roland Wakelin (1887-1971), Brett Whiteley (1939-92) and Blamire Young (1862-1935). 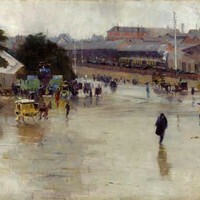 Like a number of other Australian art museums, AGNSW possesses a wide-ranging assembly of Asian art - including examples of Japanese Art (ceramics and bronzes), traditional Chinese art, including lacquerware and calligraphy, items of Korean art, as well as works from India, the Himalayas and SE Asia. AGNSW's collection of Oceanic art from the Pacific region (Polynesia, Micronesia, Melanesia and New Zealand) is noted for its holdings of Papua New Guinea Highlands art, acquired largely from the renowned Moriarty Collection. Other items of tribal art from this region include works from the Solomon Islands, Vanuatu and West Irian Jaya. AGNSW's impressive collection of "postmodernist art" (c.1960s-present) features works by many of the top contemporary artists in Australia and around the world. In fact, as a result of the recent gift from the John Kaldor Collection, it now represents the most comprehensive assembly of contemporary art in the country. In its Australian works, the emphasis is on abstract paintings, Australian Expressionism and Pop art; while the international side concentrates on movements such as Nouveau Realisme (led by Yves Klein), Minimalism and Arte Povera, as well as Conceptual art. The contemporary collection contains important works by more than 400 artists. They include Turner Prize-winners like Antony Gormley (b.1950), Anish Kapoor (b.1954) and Richard Long (b.1945), along with international postmodernist artists like Juan Davila (b.1946), Fiona Hall (b.1953), William Kentridge (b.1955), Janet Laurence (b.1947), Patricia Piccinini (b.1965) and Cy Twombly (1928-2011). The Kaldor Collection has brought in-depth representation of artists such as Francis Alys (1959), Christo & Jeanne-Claude (Christo Javacheff b.1935; Jeanne-Claude Denat 1935-2009), Thomas Demand (b.1964), Sol LeWitt (1928-2007), Nam June Paik (1932-2006), Robert Rauschenberg (1925-2008) and Ugo Rondinone (b.1964). The development of 19th-century Australian photography is traced using works by Charles Bayliss and Kerry & Co. Subsequent schools such as Australian pictorialism, modernism and postwar documentary photography are represented by the Sydney Camera Circle, Max Dupain (1911-92) and David Moore (1927-2003). Contemporary lens-based art is exemplified by the works of Tracey Moffatt (b.1960), Fiona Hall (b.1953), Micky Allan (b.1944), Mark Johnson (b.1946), Max Pam (b.1949) and Lewis Morley (1925-2013). International photographic art is represented by English pictorialism (works by Julia Margaret Cameron) as well as avant garde art from Germany (photos by Laszlo Moholy-Nagy and John Heartfield), Russia (Constructivism) and France (Surrealism). Photo-documentary in 20th-century America is illustrated by the work of Lewis Hine (1874-1940) and Dorothea Lange (1895-1965), while fashion photography is represented by artists like Helmut Newton (1920-2004) and others. Chronologically speaking, AGNSW's collection of Western painting and sculpture begins with oil paintings by Domenico Beccafumi (1486-1551), Agnolo Bronzino (1503-1572), Niccolo dell'Abbate (1509-71), Peter Paul Rubens (1577-1640) and Canaletto (1697-1768), among others. After this comes British Victorian art, with major works by John Constable (1776-1837), Lord Frederic Leighton (1830-1896) and Sir Edward John Poynter (1836-1919). Nineteenth century European artists are represented by Eugene Delacroix (1798-63), Ford Madox Brown (1821-93), Van Gogh (1853-1890), and Impressionist painters like Claude Monet (1840-1926), Paul Cezanne (1839-1906) and Camille Pissarro (1830-1903). Major 20th-century painters in the collection include Pierre Bonnard (1867-1947), Georges Braque (1882-1963), Pablo Picasso (1881-1973), Ernst Ludwig Kirchner (1880-1938) and Giorgio Morandi (1890-1964). Sculpture is exemplified by major artists including Auguste Rodin (1840-1917), Henry Moore (1898-1986) and Alberto Giacometti (1901-1966). In addition to showcasing its permanent collection, the AGNSW hosts about 30 art exhibitions every year. These include regular annual exhibitions such as the Archibald Prize (for portrait art), the Sir John Sulman Prize (for the best genre painting and/or mural), the Richard Wynne Prize for landscape painting and the William Dobell Prize for drawing. The gallery also stages the annual ARTEXPRESS exhibition, showcasing Higher School Certificate Visual Arts Examination artworks from schools across New South Wales. Open: every day 10am to 5pm. Oldest prehistoric art in Australia to be carbon-dated.  For more about Australia's finest painters and sculptors, see: Homepage.